In a previous post, I mentioned about Muni’s decision to end paper versions of the yellow BART to Muni transfers from Daly City BART and that it will go electronic only via the Clipper card. The message being given to the public is going in multiple directions, so I’m going to clarify this by getting the message from the source (SFMTA/Muni). The last sentence (highlighted in bold) throws the whole situation in the wrong direction. My interpretation of the last sentence: If a person exits Daly City BART with their Clipper card and boards the SF State shuttle, they are obligated to a free ride back to BART via Muni 28 line. Therefore, the last sentence from Muni (highlighted in bold) clearly states that a passenger must take an outbound ride on Muni (not the SF State shuttle) in order to qualify for the return ride back to BART. How does that work? The free rides (both outbound and inbound) is automatically voided after one hour passes from the time the passenger exits the BART station. 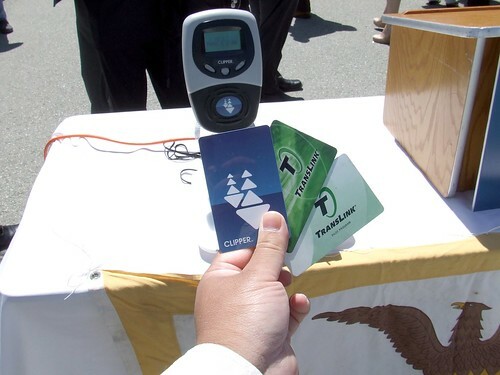 A person "earns" their free ride back to Daly City BART only if they validate their Clipper card by tagging their card on a Muni bus when leaving Daly City BART. Since Muni is the official authority regarding this matter, SF State is not correct in their statement that taking the campus shuttle qualifies for a free ride on Muni back to the BART station. There's very few solutions that can resolve this matter, such as installing Clipper card readers on SF State shuttle buses to validate the cards when students board the shuttle at Daly City, but as long as there are no more yellow paper transfers, this will be a long term problem and will surely rake Muni extra $2 fares here and there. Scenario #1: A passenger exits Daly City BART and uses the same Clipper card they exited to ride Muni 28 to SF State within one hour of exiting the station. The passenger returns from SF State to Daly City BART via the 28 line within 24 hours of boarding the first Muni bus using the same Clipper card. What is the correct answer? Scenario #2: A passenger exits Daly City BART and rides the SF State shuttle to campus. The passenger returns to Daly City BART via the 28 line after his/her classes are over for the day and uses the same Clipper card he/she exited BART with. What is the correct answer? Scenario #3: A passenger exits Daly City BART and gets picked-up by a family member to take them home. The passenger rides the 28 line back to Daly City BART the next morning using the same Clipper card he/she used to exit BART yesterday. What is the correct answer? Answer to Scenario #1: The passenger receives a free ride on Muni for exiting BART ($0 deducted from Clipper card), and receives a free ride back to BART ($0 deducted from Clipper card). The reason: He/she followed the procedures correctly: Exited BART and entered Muni with same Clipper card within one hour of from time of exit of BART gate to the bus, and boarded Muni for the return trip within 24 hours. Answer to Scenario #2: While the passenger gets a free ride away from BART via the campus shuttle, he/she is not eligible for the free ride back to Daly City BART because Muni’s rules state a passenger must make an outbound trip on a Muni bus. Answer to Scenario #3: Similar to the answer for Scenario #2, passenger does not qualify for free Muni ride back to Daly City BART because the passenger did not ride Muni away from the station.